The Day Z Mod allows you and friends to explore a barren world empty of all life, but full of danger. Explore, discover, fight and survive this amazing mod. This mod is based on the Day Z Mod for ARMA II, an online FPS game that allows you to do pretty much the same thing as already explained. The Day Z mod instead focuses on infection, and you will most likely find some zombies whilst you are exploring with companions. To use the Day Z Mod you first of all need to install the mod with the help of Minecraft Forge. Then you can simply load up your latest Minecraft game and enjoy its features automatically. This mod focuses on giving you the bare essentials to survive, and you need to scavenge for them. On your travels you will find new food items such as bottle of vodka, bottles of whiskey and even canned food. 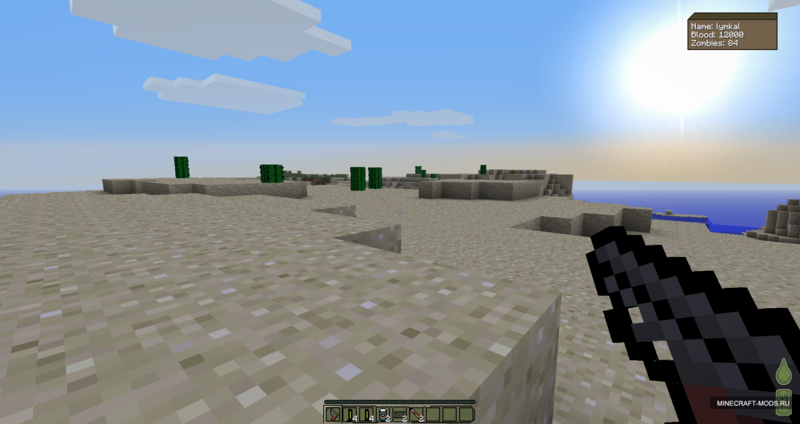 This mod also adds some new healing items into the game, including bandages, antibiotics and more. There is also a new ranged of WW2 like guns, including the Lee Enfield and the Makarov. Of course, if there is a gun you will surely need ammo for it? This mod has you covered! Next, download the Day Z Mod and drag and drop it into the .minecraft/mods folder of your Minecraft directory. There are currently no public changelogs for the Day Z Mod.